Over his long career, David Adams Richards has carved out a unique body of work, in the process developing a form of literary expressionism that illuminates the moral depths – and depravity – of several communities along New Brunswick’s Miramichi River. Though not always explicitly Christian, Richards’ vision is framed by absolute moral values and a rejection of the liberal humanist ethos of so many contemporary authors. What prevents his work from descending into sermonizing allegory is a seemingly folksy storytelling technique married to a gift for dialogue and detail. Like Dostoevsky, Richards reveals his characters through how they talk – to each other, to themselves, and to whatever higher power rules their troubled lives. 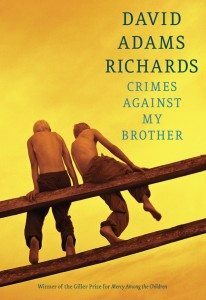 In Crimes Against My Brother, Richards returns to the communities near Good Friday Mountain, the setting of such recent works as The Friends of Meager Fortune and Incidents in the Life of Markus Paul, as well as his much-lauded Scotiabank Giller Prize–winning novel, Mercy Among the Children. Characters from those novels appear in minor roles in this new work, including Mercy’s saintly Sydney Henderson. This bond is not only a rejection of the Church, but also of the vow made by Sydney Henderson in Mercy. Sydney promised God that he would “never raise his hand or his voice to another soul,” if God allowed a boy he’d badly injured to survive. Like most of the locals, Ian, Evan, and Harold are disdainful of Sydney’s pacifist ways and the shame and poverty they cause his family. Crimes Against My Brother is narrated by an older cousin of the boys, a local “oddity” who left the Miramichi region to attend university and went on to become a distinguished professor of sociology. He recalls the story of the pact and its tangled outcomes from the present day, reconstructing events out of his own experience, local sources, and several police investigations. The novel traces Ian, Evan, and Harold’s transformation from recklessly proud teenagers to bitter adult enemies bent on destroying each other, either consciously in Harold and Evan’s case, or subconsciously in Ian’s. Each man is brought low by sins and passions for which he is “culpable in increments,” moral decay seeping into them via a succession of poor decisions, impulsive acts, bad luck, and rejected moments of grace and wisdom. The principal external agent of their ruin is Lonnie Sullivan – the kind of duplicitous, morally stunted but physically vital tyrant that Richards excels at bringing to life on the page. A salvage dealer, contractor, loan shark, and land speculator, Lonnie manipulates the fortunes of dozens of families by means of bad debts, the promise of employment, and physical intimidation. He employs the three cousins as teens and soon has them deep in his debt. Lonnie’s only rival for the boys’ loyalty is Joyce Fitzroy, their alcoholic great uncle, rumoured to have over $100,000 hidden in his shack, a sum the boys hope to inherit. Lonnie hatches a plan to pit the boys against each other – and to nab Joyce’s fortune – by playing them off each other for the affections of Annette Brideau, a beautiful teenager he has brought under his control. His machinations, always couched in the language of pragmatism and moral rectitude, eventually pay off, in ways both violent and unexpected. This subtle investigation into humanity’s almost infinite capacity for self-deception helps to balance the novel’s more sensational elements, which include murders, beatings, child deaths, industrial sabotage, and the swindling of the town by a multinational corporation. No conscience is left untested, but Richards also bestows tenderness and compassion on the troubled blood brothers. It makes for compelling reading.